This week we take a brief pause in our series on the choices facing the developed world to look at some items that are catching my attention. We will get back to the US next week, as somehow I think we will not solve our problems between now and next Friday, and there will be plenty left for us to talk about. So today we look at the "shift" in Fed policy, and at the balance sheets of central banks, US GDP, Portugal and the ECB, the LTRO policy, and yes, there's even a tidbit on Greece. Plenty of ground to cover, so with no "but first," let's get started. The Fed announced this week that it will keep rates low until 2014. Interest rates responded by getting even flatter. This policy change has caused a lot of negative press, for some good reasons, but I want to offer a somewhat different take on their motives. Telling us that rates will stay low for another three years has a lot of negative implications. First, it says that the Fed does not expect a recovery of any significance during that time (more on this week's GDP numbers further on). Second, it tells any individual or business that there is no reason to hurry and borrow money to get lower rates. You can wait and see how things turn out before you decide to act. "In our view the Fed's new policy is an act of desperation rather than something to celebrate. The FOMC has used all of its conventional weapons and a lot of unconventional ones and is essentially out of ammunition. The banking system is swimming in excess reserves that it is not using----adding more won't make much of a difference. This is a classic liquidity trap where further easing will not be much help. The stock market strength assumes that the economy is getting stronger and that company earnings will remain at elevated levels. We think that this will not be the case, and that the market is subject to substantial downside risk." I agree with their sentiments and conclusions, but I think the Fed is in more than a liquidity trap. For lack of a better term, let's coin one and call it a "transparency trap." The Fed and the FOMC do not create their policies in a vacuum. The individual members talk to business leaders at length every week, and their staffs are also seeking out opinions and reactions. While they may not talk to you and me, they are aware of the reactions to their positions. Let's take that as a given. These are not men and women who are easily pushed into a position. They get where they are by being able to forcefully take a position and push for their policies. We may not like their positions, but they put some thought and a lot of work into making them. Frankly, it is a damn hard job. No matter what they do, they will make a lot of people upset. And this week is a case in point. Ben Bernanke has been quite open in that he wanted a more transparent Fed. He wanted explicit inflation targets long before he joined the Fed. He wanted more communication and openness from the FOMC. Many in the media and elsewhere lauded those sentiments, including me, as the more we know about their thought process, the better we can all plan. But slowly, Bernanke has put his stamp on the Fed, including his views on transparency. His speeches and presentations are far more comprehensible than the foggy pronouncements of Greenspan. He has started doing press conferences. 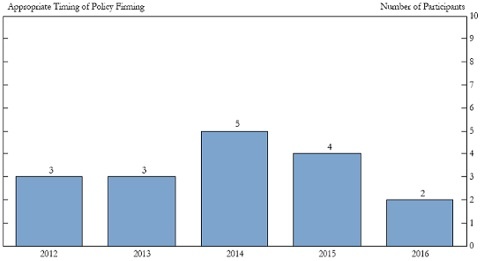 And with this meeting, he has persuaded the 17 members of the FOMC to offer projections about the economy – in this case, where they think rates will be for five years into the future. "The Fed knocked down its forecast of economic growth a few notches for the entire forecast period (see table below). The Fed sees the economy growing around 2.2%-2.7% in 2012. The Blue Chip consensus forecast of growth in the US is 2.2% on an annual average basis as of January 2012, while the IMF projects growth of 1.5% for the United States in 2012 on a fourth quarter to fourth quarter basis. All in all, not a very upbeat group. Given their views, it is no wonder they expect rates to stay low. And thus we have the transparency trap. They are now telling us what they really think, something that most people in most places wanted only a short while ago. And we see the 17 individual forecasts, so we can get a sense of the range of opinion, which is quite wide, actually. Look at the following graph, which shows us when the members of the FOMC expect rates to finally begin to inch up. If we want to know what they think, and they tell us, are we then going to shoot the messenger? We asked, they delivered. If they gave us those projections and did not change their interest-rate projections from the last meetings, they would be subject to ridicule, because they did not say in the statement what they really believed. In a very real way, they were forced to say they expected rates to be flat for 2-3 years. To say anything else would have been rather pointless, at best, and subject to even more intense criticism at worst. Once they opted for transparency, they were forced to take the position they did. Put this in the category of "be careful what you ask for, because you may get it." Now, take note. And I do not mean this as a specific indictment of Fed economists and forecasters. This goes for all of us who dare venture a thought about the future. There is a natural tendency to take current conditions and project them forward. Which is why stock analysts who forecast earnings are so predictably bad. And the all-star team of blue chip economists (in the US) have yet to predict a recession, even when one has started, let alone in advance! Once you rely on models, you are doomed to error. I have read studies that show analysts are not even as accurate as one would expect from simple random selection. I think we should take these Fed projections as more of a curiosity, for at least the next two years. In two years we will have 16 data points (8 meetings a year) which will show us some of the evolution of their thinking, and that will be very interesting. For what it's worth, if someone had asked me, I would have said that rates will be flat for a very long time. We inhabit a deflationary, deleveraging reality. That suggests lower inflation. I have written at length why unemployment will be higher than we are comfortable with; it is just a product of the current environment and simple math. To see unemployment come down we need to see growth in the 3.5% range, and our next topic will show us why we are not even close to that number. GDP came in at 2.8% for the 4th quarter of 2011. That is a respectable headline number, given that the US economy only did 1.6% for the whole of last year. For those who look at this number as half full, I offer the following observations. First, examine GDP growth for the last few years. The 4th quarter has been much better than previous quarters, and then GDP dropped off again. I suppose one could spin inventory growth as businesses being optimistic about future sales and building inventory, but given the weaker retail sales of late (in comparison to previous years) that is rather doubtful. And so all that really happened was a total reversal of inventory sales in the previous quarters. There will be a drawdown of inventories over the next few quarters, which will be a drag on future GDP numbers, much like the pattern we have seen the past few years. Retail sales growth was not strong. And for the last year, 90%-plus of total retail sales has come from decreased savings, as the savings rate dropped from 4% to 2%. It will be hard to go much lower, so the "boost" we got last year from retail sales accounts for most of the year-over-year growth in GDP. If most of retails sales growth came from reduced savings, that suggests that retail sales will not offer much in the way of growth for the coming year. Just saying. Further, when calculating real GDP, one subtracts inflation. The Fed prefers an inflation measure called PCE (Personal Consumption Expenditures). It is essentially a measure of goods and services targeted toward individuals and consumed by individuals. The number you read in the various media is the CPI or Consumer Price Index. The CPI is inflexible, in that it's always the same basket of goods. PCE on the other hand, is supposed to take into consideration the notion that if steak is too costly, we'll eat hamburger. The CPI is typically 0.3-0.5% higher than the PCE, which is convenient if you want the GDP number to look better. The Fed changed to PCE in February of 2000. The change was buried in the footnotes of the annual Humphrey-Hawkins testimony by then-Fed Chairman Greenspan. So the anemic growth of 1.9% for the last decade would have been even worse if we had used the previous measurement of inflation (CPI). Understand, there is an argument in favor of using PCE, as many academics argue that CPI actually overstates inflation. But there is also an argument to use CPI. It somewhat depends on what you want the final numbers to be. Fast forward to today, and the year-over-year change of CPI was 2.5%, with the PCE only rising 1.7%. And last quarter was down sharply, to +0.04% on an annual basis. An anomaly of lower energy and commodity costs? Partially, for sure. So if their target rate of inflation is 2%, using PCE gives the Fed grounds for a looser monetary policy. All in all, GDP was helped by numbers that are not likely to repeat. For a long time I have maintained that the US economy is in a Muddle Through range of around 2%. I remember when last year at this time we had estimates of 4-5% growth for 2011. I looked so bearish. Now, not so much, as 2% would have been better than what we got. I think we will be lucky to Muddle Through again this year. Mind you, if it was not for a potential shock coming from a serious European crisis and real recession, the US should not slip into outright recession this year. I got this note from bond maven (and Maine fishing buddy) Jim Bianco (courtesy of Barry Ritholtz). It made me sit up and take notice. 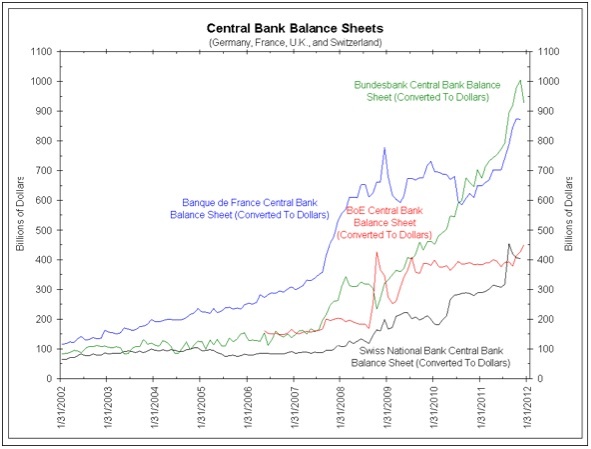 He compared the balance sheets of the four largest central banks (the US, Europe, Japan, and China) and then four European central banks (Germany, England, France, and Switzerland). There has literally been an explosion in all their balance sheets. Interestingly, China has seen the largest growth. And where is the inflation that one would expect from all the monetary printing? You can see some of it in China, but not anywhere else. "2011 was so difficult because all stocks seemingly moved together. It was as if every S&P 500 company had the same chairman of the board that knew only one strategy, resulting in a high degree of correlation between seemingly unrelated companies. "Massive central bank involvement in the markets risks returning us to a de facto centrally planned economy. Those S&P 500 companies all have the same chairman; it is Ben Bernanke because his policies are affecting everybody. That is what makes money management so difficult. Correlations will ebb and flow; they always do. But what makes them go away? This will only happen when governments and central banks go away. "But if they go away, then does that not mean things get ugly? Maybe they do get ugly, but it also means that we sort out the excesses in the market. We reward the people that do the right thing and we punish the people that do the wrong thing. And we have an adjustment process that may be ugly, but then we have a period of long expansion. "Central banks are ruling markets to a degree this generation has not seen. Collectively they are printing money to a degree never seen in human history. "So how does this process get reversed? How do central banks pull back trillions of dollars of money printing without throwing markets into a tailspin? 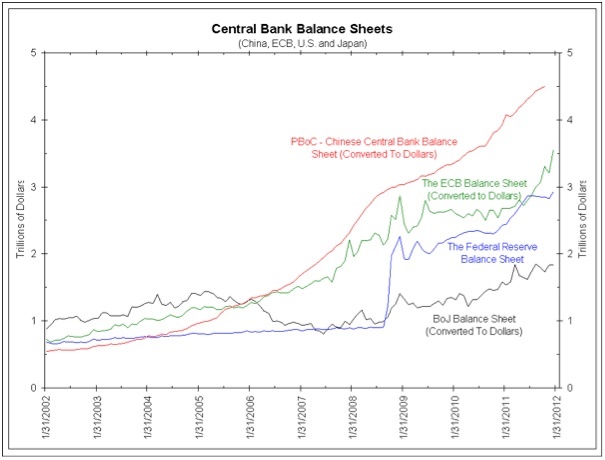 Frankly, no one knows, least of all central banks as they continue to make new money printing records. "Until a worldwide exit strategy can be articulated and understood, risk markets will rise and fall based on the perceptions and realities of central bank balance sheets. As long as this is perceived to be a good thing, like perpetually rising home prices were perceived to be a good thing, risk markets will rise. "When/If these central banks go too far, as was eventually the case with home prices, expanding balance sheets will no longer be looked upon in a positive light. Instead they will be viewed in the same light as CDOs backed by sub-prime mortgages were when home prices were falling. The heads of these central banks will no longer be put on a pedestal but looked upon as eight Alan Greenspan's that caused a financial crisis. "The tipping point between balance sheet expansion being bullish for risk assets versus bearish is impossible to know. Given the growth rate of central bank balance sheets around the world over the past few years, we might not have to wait too long to find out. Enjoy it while it is still bullish." The ECB is taking almost any quality asset a European bank offers up and putting it on its balance sheet, as part of its long-term refinancing operation (LTRO). Basically, this allows a bank to post an asset at the central bank and receive 1% money, which they can turn around and use to either improve their own balance sheet and liquidity or buy European sovereign debt at, say, 6%. If the bank then makes 5% on the loan and leverages it up, it can "get whole" in a short time. This is the same principle (in theory) that Paul Volcker used in 1980 when he allowed US banks to carry the debt of defaulting Latin American countries at face value. Given enough time and interest-rate spread, a bank can work its way out of a problem. And it worked for Volcker. Eventually, US banks made enough money to be able to write off the bad debts. While this is a band-aid, an attempt to cover up the real problem of banks that are basically bankrupt and sovereign countries that are either in default or at risk of default, it is so far proving to help. Germany has essentially thrown in the towel on keeping the ECB from printing money. While they still growl and bark, like any well-trained dog they stay in the yard. They are a big dog, and their barking makes you nervous as you walk past, but so far they are allowing the ECB to prop up banks throughout Europe. On that point at least, Sarkozy won. As long as LTRO continues, it should postpone the problem of a true banking crisis – until Portugal has to default, and then all eyes turn to Italy and Spain. If the ECB is allowed to fund Italy and Spain, even through the back door, it will mean Germany has made its choice to keep the euro intact, no matter the cost. One of my very good friends had a small private dinner this week with the chairman of a major German bank, who remarked, with a sense of gallows humor, that he thought he could get his fellow German banks to chip in enough money to give to Greece to just make them go away. They really have Greek Exhaustion Syndrome. He also thought Portugal would eventually would have to leave, and said he thought he would take a haircut on Irish debt. Italy and Spain will somehow make it. At least that is the view from the top of the German bank pyramid. Portuguese interest rates are soaring. Without life support from Europe, they cannot keep up their borrowing at rates that will allow them to recover. While they are gamely trying to reduce their deficit, austerity is reducing their GDP and thus their tax revenues. They will have no choice but to default at some point. The interesting case is Italy. They have room in their budget to cut, as I have outlined in prior letters. If the ECB subsidizes their debt (lowering the interest-rate cost) or an agreement is reached to lower the rate on their bonds, they theoretically could make it. But either path is default by another name. Maintaining the status quo is not possible. It will not be long before they are at 130% debt-to-GDP, if Europe falls into recession. The IMF has long maintained that 120% is the line in the sand. It is just a matter of who pays and how the payment is made. But someone will pay. "Eurozone policy-makers – from President Sarkozy and Wolfgang Schäuble to the former President of the ECB, Jean-Claude Trichet – advocate that Italy and Spain should emulate the Baltic states and Ireland. These four countries, they argue, demonstrate that fiscal austerity, structural reforms and wage cuts can restore economies to growth and debt sustainability. Latvia, Estonia, Lithuania and Ireland prove that so-called "expansionary fiscal consolidation" works and that economies can regain external trade competitiveness (and close their trade deficits) without the help of currency devaluation. Such claims are highly misleading. Were Italy and Spain to take their advice, the implications for the European economy and the future of the euro would be devastating. "What have the three Baltic economies and Ireland done to draw such acclaim? All four have experienced economic depressions. From peak to trough, the loss of output ranged from 13 per cent in Ireland to 20 per cent in Estonia, 24 per cent in Latvia and 17 per cent in Lithuania. Since the trough of the recession, the Estonian and Latvian economies have recovered about half of the lost output and the Lithuanian about one third. For its part, the Irish economy has barely recovered at all and now faces the prospect of renewed recession. "Domestic demand in each of these four economies has fallen even further than GDP. In 2011 domestic demand in Lithuania was 20 per cent lower than in 2007. In Estonia the shortfall was 23 per cent, and in Latvia a scarcely believable 28 per cent. Over the same period, Irish domestic demand slumped by a quarter (and is still falling). In each case, the decline in GDP has been much shallower than the fall in domestic demand because of large shift in the balance of trade. The improvement in external balances does not reflect export miracles, but a steep fall in imports in the face of the collapse in domestic demand." Portugal and Greece are on that path, if they do not opt out of the eurozone. Italy and Spain cannot avoid the sad results of too much debt without major European support, which means the ECB, as no country will offer that amount of help, as none has the money to do so. But that means a lower-valued currency and purchasing power, higher energy and commodity costs, etc. As I keep saying, it is not a matter of pain or no pain, it is simply a choice of which pain and how much of it you want to have. It is interesting to watch the game being played with Greek debt (merely interesting, because I have no Greek debt). Private bond holders are now looking at only getting about 30% on the euro. They are now asking that the ECB share some of their pain, and the IMF seemingly agrees that the ECB should. The ECB is aggressively resisting any such notion. An interesting principle is being set here. If you do it for Greece, then the line will get much longer. The euro is on its way to parity with the dollar, as I have said for a very long time. Those predicting the death of the dollar (at least against major world currencies) and hyperinflation do not understand the rather vicious nature of deflation and debt deleveraging. But that is a topic for a later letter. "Greece plans an orderly exit out of the Eurozone according to two sources close to Mr. Papademos, Greek Prime Minister, who spoke on condition of anonymity earlier today. The sources confirmed that plans are ready to return to a legacy currency given the current circumstances and that such exit would be dealt with, quote ‘in as orderly a fashion as possible' unquote…. "A Greek exit strategy will probably not be announced officially until early March when the EU finance ministers meet." Well then, we shall see. What a week. Neil Howe (The Fourth Turning) came in at the last minute for a quick dinner with old friends Barry Habib and David Galland of Casey Research (among others). What a thought-provoking night. And the next night Bloomberg hosted a small dinner with some of the hedge-fund mavens here in Dallas and Fort Worth, and I was part of the entertainment. I learned a lot in the free-for-all give and take. No shy types at that table. I leave for Cape Town, South Africa for a very short trip in ten days: I'll give a speech and turn around the next day and come back. Then I am home until the middle of March, when I go to Stockholm for another speech, then to Geneva for a day for some quick meetings; and then I will either come home on the weekend or stay in Paris to attend the Global Interdependence Center's conference on central banking. That promises to be a very lively and vigorously debated theme, and a lot of good friends will be there, so there will be a nice spirit of bonhomie for springtime in Paris. I don't go to many conferences as a participant, but this one is the topic du jour. Think about joining me. (http://www.interdependence.org/programs/inaugural-meeting-of-the-global-society-of-fellows/ ) And maybe London, since I'll be in the neighborhood. This has been an especially busy week, with some very important events. We officially launched Mauldin Research Trades, which will be marketed by Bloomberg. I am thrilled to have such a solid relationship with one of the premier names in the financial world. MRT is only available through Bloomberg. It is designed as a service for institutional and other large trading funds. Basically, we have brought together 14 of the world's best technical traders, over a broad expanse of markets, to develop very specific ideas based on my macroeconomic views. We hope to average 3-4 trades an issue, along with updates. My good friend, business partner, and mortgage-market expert Barry Habib is heading this up. If you are interested, contact your Bloomberg representative. Then we also came to an agreement with another firm to expand the publishing side of my business, which will actually free me up to do more of what I like to do, which is to read and research and write my letters to you. I am quite optimistic that we will be able to do more for you, which is my #1 goal. Other positive changes are coming as well, which I will announce in the future. In the meantime, it is time to hit the send button. Once again it is late, but I will sleep in tomorrow. Have a great week. Mine will be good, as Rich Yamarone, Woody Brock, and Mark Yusko come in for a dinner on Tuesday, and then we do the Dallas CFA forecast dinner on Wednesday evening. What fun! Jan. 29, 2012, 6:50 p.m. I am a physician in the US. 42 years ago I was an intern at a hospital and had a hernia repair performed on myself. 36 hours later I was again on duty. Last week my son-in-law, a Canadian with a Fortune 400 company, had a hernia repair. He was given 6 weeks leave of absence before he returns to work. Could this have anything to do with malfunction of the world economy? Jan. 29, 2012, 1:36 a.m. The charts show that the central banks have become “pawn shops” as they try to keep the credit-based monetary system afloat by exchanging poorer quality assets for “money” (really Notes, as in someone’s liability). Soon it will be checkmate. Jan. 28, 2012, 7:11 p.m. I see the Feds action far more simplistically. The US wants growth and employment. So they send a signal….We can’t enact trade barriers/import taxes; instead were giving you cheap loans to invest in growing your business to make them more competitive, which will employ more people and swell our tax coffers, so USA can service its debts through that growth. As for Greece…they know that they have simply become the bullet in a Mexican stand-off. They will end up walking away and paying off the debt at 1% in devalued Draculars. Jan. 28, 2012, 6:06 p.m.
Hi John, as always an understandable and topical read. As before I do take issue with a fixation amongst practically all commentators (including you) that somehow, the level of economic activity is somehow desirable and justified. Does it not follow that if a path of indebtedness pursued over decades by profligate governments via fiscal deficits has spawned a level of economic activity that is unwarranted? How is it bad to remove the excess activity caused by this profligacy via an evolved welfare democracy (buying votes with benefits). It used ot be that the Fed would provide the punch bowl at the party at a time when people were sober and remove it when they were drunk. Now they provide the punch when people are already drunk and are behaving atrociously via a corrupt political and banking system. In this sense corruption is the favouring of the few at the expense of the many. I maintain that the actions of central banks to allow banks to rebuild bank balance sheets whilst at the same time impoverishing the consumer is an act of corruption. I also maintain that current levels of economic activity are fraudulent since they are dependent of the perpetuation of the impoverishment of the consumer in favour a banking system, either via taxes or inflation or “haircuts” taken from savings. There is a level of economic activity that neither encourages corruption nor results in fraudulent economic activity sponsored by central governments who need voters to remain on benefits. The level of activity might be 40% below that currently entertained, it might be 20%. If Ireland is not yet growing it will be because it has not found the level of sustainable activity that can be afforded, or because it can never recover with the level of odious debt imposed on it by banks and the ECB. Jan. 28, 2012, 5:13 p.m. In the US, I wonder to what extent the Fed is simply doing a digital transfer of dollar-based reserves to corporations and financial institutions in exchange for bad or risky assets? Is it money printing (put in circulation) until the new found reserves are spent or loaned out—which is apparantly not happening to any great extent? I seems like it could be a zero sum game at this point. Also, couldn’t the assets being purchased by the Fed eventually be worth more than they paid? It would be interesting to compare the Fed balance sheet trends (which began to grow in significantly 2009 to 3$ trillion now) with corporate balance sheet trends (could it be around 3$ trillion now).